Patrick: Our very own Mark Mitchell has expressed to me on a couple different occasions that he doesn’t get the appeal of either Darth Vader series that Marvel has published. His rationale is that the more we know about Darth Vader, the less terrifying he becomes. And he’s not wrong: there’s a whole trilogy of movies clarifying Anakin’s motives and they only serve to make the Dark Lord of the Sith more of a bumbling blunt instrument than an evil mastermind. But with Darth Vader 22 writer Charles Soule shows us how scary the motivations of a truly evil Dark Side master can be. Of course, Vader proves himself to be even scarier by rejecting Lord Momin’s ideology in favor of a far more direct motivation: accumulation of power. Basically the whole issue sets up this dichotomy between Darth Vader and Lord Momin. Vader is compellingly silent as he tries to unpack what happened at the end of the previous issue. He lifts Momin’s helmet with the force and walks it into a Mustafarian cave. It’s only then that Vader probes, and he does so in the most direct way imaginable, revealing nothing of his own motivations. “What are you?” Vader doesn’t screw around. And there’s a second where it looks like Momin might respond with the same brevity. “I am Momin.” But here’s the clutch part – artist Guiseppe Camuncoli pivots back to Vader’s eyes just for Soule to give him nothing to say. This is an old interviewer’s trick: stay silent and your subject will keep talking. It works. Momin doesn’t just say what he is, but why he is. This dark artist of the force spills his philosophy, his motivation and his past and Vader doesn’t have to offer anything of himself in return. The majority of this issue is an extended flashback to Momin’s dark, twisted history, as narrated by the man himself. He takes his origin back to his childhood, which immediately recalls the Anakin we met in The Phantom Menace. Unlike Anakin, there is no corruptible sweetness in Young Momin. He’s a sociopathic monster from the get-go, mutilating his mother’s pet just to get a reaction out of her. That ends up being Momin’s MO – eliciting that fear reaction. It makes him absolutely monstrous, but it’s sorta satisfying knowing that he can be ideologically thwarted. Take, for example, his plan to freeze a city in the split second prior to them being vaporized. He succeeds in destroying the city, but considers himself defeated because the Jedi stopped him from making the moment last forever. Momin’s ideological hardline ends up being a weakness, part of what allows the Jedi to slice his head off. There’s a fascinating moment when Vader, his own helmet discarded, is about to try on that same look. But he physically rejects it. I love this. It’s a simple assertion from the creative team that we will never get to understand Darth Vader in as simple terms as we are able to understand Lord Momin. Check out how the helmet actually travels from right to left on the page as the reader’s eye travels down. The Momin-path would be regressive, backpedaling on decades on scary Darth Vader-isms by stapling needless motivation on one of the best movie villains of all time. Spencer, we do get half a hint at what Momin suspects Vader’s motivation to be in the final pages. Momin says “You will see her aga-” before being interrupted by a force-choking. Is Vader sending the signal that his love for Padme is in fact what’s motivating him? Or does he even resent that another evil dude thinks they can manipulate him with something so trivial? And, really, what’s scarier? Spencer: Patrick, I’m actually inclined to believe Momin’s suspicion here. Vader seemingly gives himself away, even if only for the briefest of moments. More than anything, Vader’s anger here seems motivated by the idea that Momin’s promise could be a lie. To me, that screams that Momin is dead on — clearly Vader has some sort of motivation on Mustafar, and trying to revive/reconnect with Padme seems just as likely as anything else. Is there anything else he even cares about anymore? This feels like the most genuine reaction Vader’s had to just about anything in a while. Of course, I might be setting myself up for failure by trying to figure out anything about Vader’s motivations in this series. Soule has built this volume of Darth Vader around Vader’s inscrutability (and much of my coverage has revolved around exploring that quality), and I can’t see that changing just yet — not completely, anyway. Patrick’s theories about Vader’s anger in this scene seem just as valid as mine, and based on his writing, I think Soule would agree with our own dear Mark that Vader is more terrifying the less we know about him. Vader’s motivations may become clearer as Darth Vader nears its finale, but I doubt we’ll ever get all that much into Vader’s head; that’s what the rest of the cast is for. 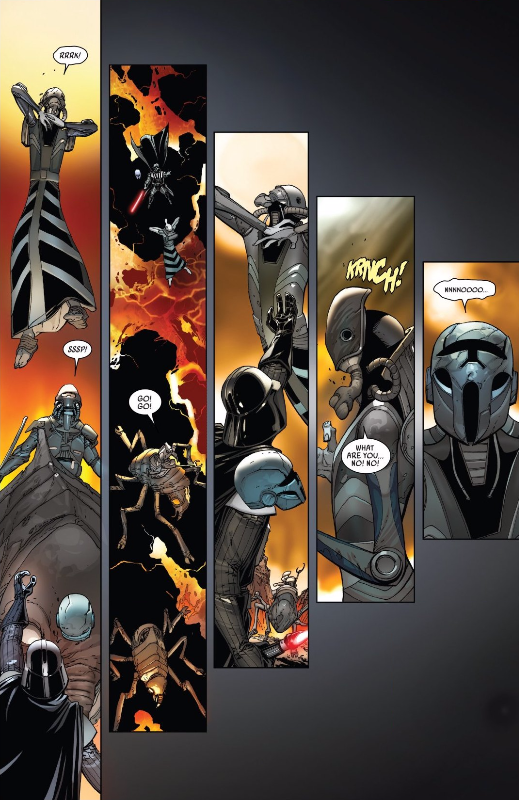 Soule has used Darth Vader as an opportunity to fill the Star Wars universe with new, complex, and often doomed characters whose perspective readers can understand even when Vader’s at his most opaque, and Momin is no exception. I’ll admit that, on my first read of this issue, I was a little disappointed by how narration-heavy Momin’s backstory was, but the actual details of his backstory are strong enough to make up for it. In fact, I even fantasized about what a storyline focused solely on Momin, that could take its time telling his story, would be like, and I’d say that’s a sign that Momin’s a character with legs. Momin’s role as a dark artist is one Soule’s explored before with his creation Muse over in Daredevil, but Momin differentiates himself by becoming a look at how art and obsession co-exist as well. Camuncoli and Soule accomplish a lot with this page. Of course, they perfectly represent the horror of this poor guard being overtaken by Vader and overridden by Momin, but it’s the fact that the panels specifically become more and more narrow as Momin reasserts himself that impresses me. Momin’s perspective quite literally overwhelms the page, but his perspective is one that’s cramped and narrow, focused to an obsessive, unhealthy degree. And even more than his desire to create art, it’s that obsession that defines Momin to me. At first, this is some legitimately useful advice. I imagine that many writers, artists, and all-around creators find it genuinely helpful when they find supposed shortcomings in their past work. Creators should never stop growing, and as sick and twisted as his “art” is, Momin initially embodies this incredibly vital piece of advice nonetheless. The “problem” is that Momin becomes obsessed with creating a perfect masterpiece when the whole point of the advice was never about perfection, but about growth. Momin was always mad, but his obsession with perfection has gifted him with a special kind of madness, one that has kept him “alive” long far longer than he had any right to be, conscious but incapable of ever being satisfied, and willing to destroy the lives of anyone who gets in his way in order to fulfill his impossible dream. In this respect, Momin serves as a valuable lesson not just to creators, but to everyone about the dangers of striving for impossible goals. Another thing about Momin that impresses me is the sheer amount of thought and planning Soule has clearly put into the character, even long before this issue or this series was in production. 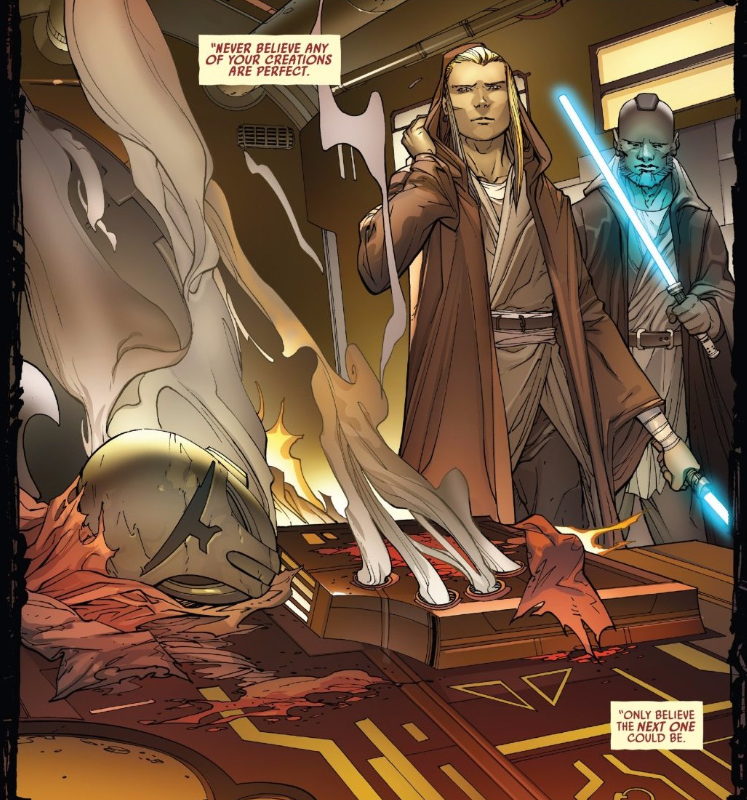 After all, Momin — or more specifically, the mask containing his spirit — first appeared in Soule’s Lando mini-series as an ancient Sith artifact corrupting Lando’s comrades. That kind of plotting and world-building is right up my alley, and it’s got me excited to see what Soule’s got in store for the last few issues of Darth Vader as well.